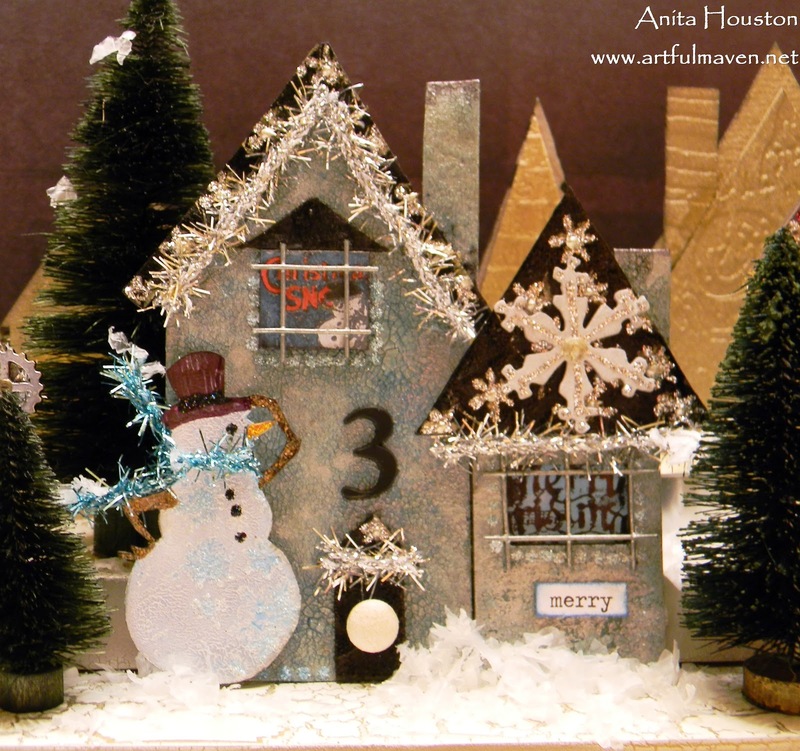 The Artful Maven: The Hood At Christmastime! It's that Funkie part of the fortnight! The challenge at Frilly & Funkie is being hosted by Rebecca Deeprose of Paper Primrose , and she wants to see "A Light in the Darkness". Create with 'light' in mind. Think candles, bulbs, lanterns, menorahs, stars, and all things that brighten this time of year, using whatever type of project you'd like. We can't wait to see what you 'enlighten' us with! And, if you need a little bright inspiration, please visit the other Design Team's blogs. For my "Lighted Christmas Village Table Centerpiece" I decided to combine this Light challenge with all of Linda's Funkie Junkie 12 Days of Christmas Tag Challenges, sponsored by the Funkie Junkie Boutique, and this is a very heavy photo laden post, so you might want to grab a beverage and snack to sustain your energy! I used as much as her color scheme and products as possible for each house and building for my inspiration, and the numbers correlate to each of her tags. As is usually the case the pictures do not due this justice. I am beyond thrilled with how this came out, and I will continue adding to it...like cars, foliage, and a few more details. The houses and buildings are each made from at least 2 pieces of Wendy's Residence Art Parts, and Tim's Artful Dwellings Sizzix Bigz Die using Grunge Board and Grunge Paper. They are mounted on two 1 inch thick wood pieces measuring 30 inches long, and the widest one at 6 inches wide, with the thinnest at 3 inches. I painted the wood gold first, then gave it a white crackle finish, followed by crystal knob feet at 5 different points, and Idea-ology corners finished it off. The candles are just tea lights hidden between the largest Idea-ology Woodland Bottlebrush trees. #6 The House of Holiday Based On Tag 7...I mixed 6 and 7 up accidentally. #7 Public School 7 Based On Tag 6...This was the other mix up. I am also submitting this piece to Simon Says Stamp & Show for "House Rules", Inspiration Journal for "JOYful Creations", The Artistic Stamper Creative Team Blog for "Home For Christmas", and the Everything Wendy Vecchi Yahoo Group Making Art Challenge #56 for "Holiday". 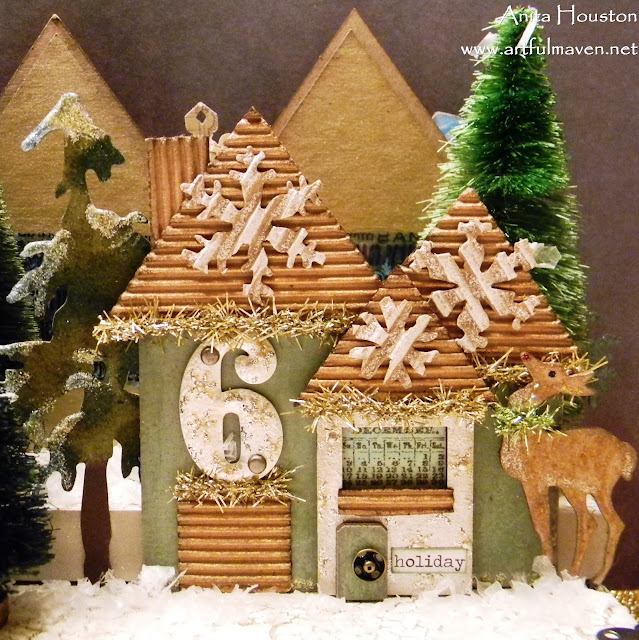 Did you start making this LAST Christmas???? There are no words to describe how amazingly gorgeous I think it is Incredible. Well I do not know where to begin... this is an amazing centre-piece that is decorative and exquisite and every visitor to your house will want to have a closer look, so I hope you are prepared for the many compliments that will be coming your way for the duration that this project is on show! It is so aesthetically pleasing to the eye. 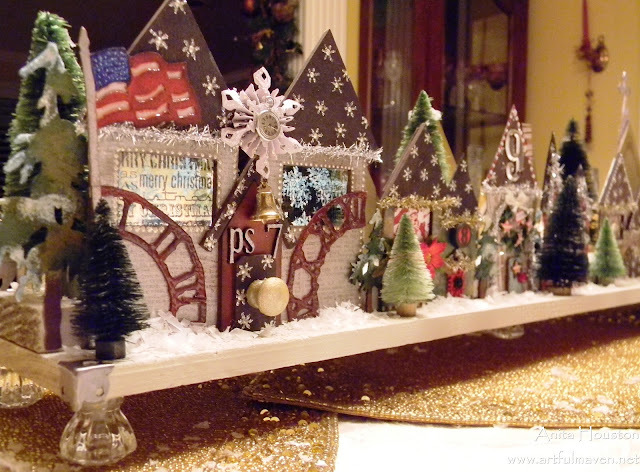 You should be thrilled with how it has come together, as it is definitely a unique way to illustrate the 12 days of Christmas, your little town has a wintry festive feel, that I would imagine is how one views a typical Christmas in certain states of the USA, you have certainly covered every element that represents the season, right down to the patriotic Stars and Stripes! And of course you have added a little funkiness as well. I applaud you for this imaginative creation you have constructed, perhaps I should start singing 'O come let us adore Anita'... or perhaps not! This has turned into a lengthy and protracted comment, but I wanted to make sure I related a narrative that would explicate how I am enchanted and captivated by your artistic talent. Wow, what a cool Christmas display you have created, I feel so envious of those friends & family that will be seeing it for real! I confess that my little chalet in the snow will not have space for such a display but I do have some cute snowmen to share when I get there. This is just spectacular! Wow! Absolutely love it so much I may I have make myself something similar. 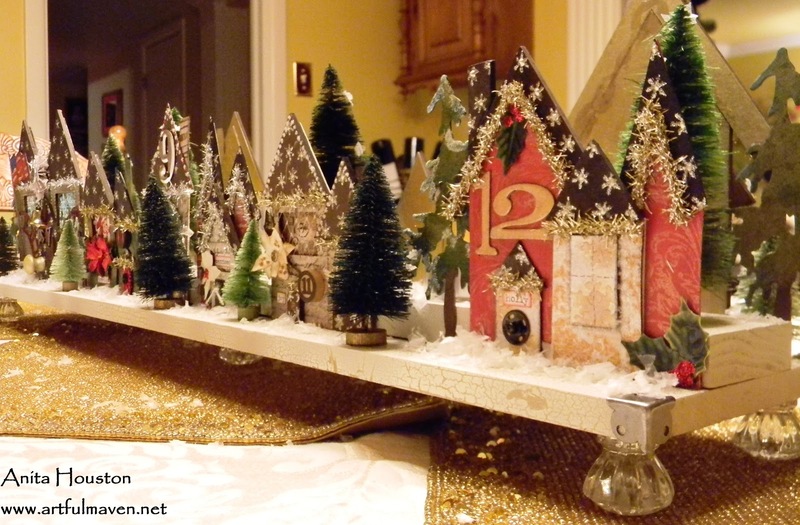 Really creative and what a nice piece to have year after year. 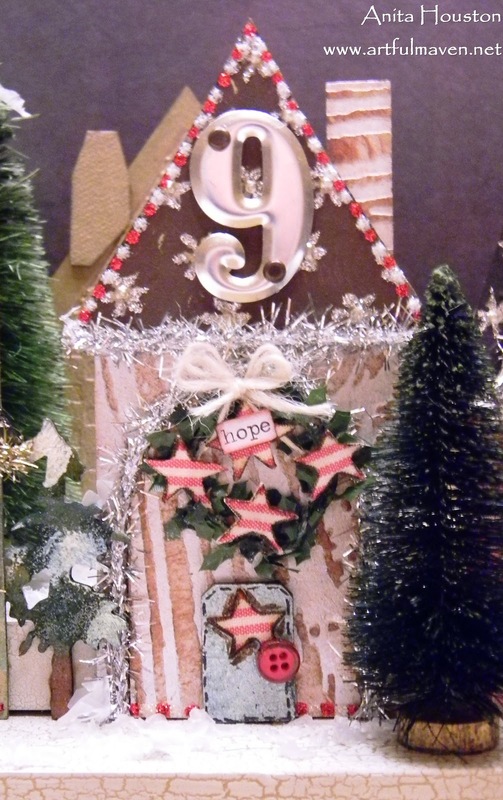 OK. You have outdone yourself and put the rest of us to shame with your mad crafting skillz! Talk about over the top! This is a totally amazing rendition. If there were Oscars or Emmys or whatever handed out for crafting genius, you'd win hands down! Это просто грандиозный проект!... очень, очень сильно и потрясающе!... Спасибо, Анита, я получила огромное удовольствие, рассматривая фотографии... Очень празднично и торжественно! ... Скажи, а сами домики-из картона или они деревянные? Хорошо и удачно подобран декор. Я тебя поздравляю с реализацией такой глобальной идеи! Anita, This piece is so fabulous that I can't even begin to tell you! You obviously put a lot of effort into it as well as a lot of love. It's just beautiful and it is something that you can treasure for many years. Oh my goodness!! That is gorgeous!! Oh my flipping stars! I don't know where to begin to exclaim and cry out with 'oohs' and 'aahs'. Fantabulous job, my friend! Just freakin' fantabulous! OMG such a creative combination of challenges. Love each tag in a different way. All over the top talented row of houses. WTG. What an amazing hood! I bet you had so many ideas floating around in your head that you could have built houses forever! Each house is spectacular in detail and technique! Holy Christmas, Batman! No wonder this took you FOREVER....I mean, this is so stunning! Wow, wow, wow! Fantastic! Stupendous! I don't have enough words! Wow, you have been a very busy girl! This is just an amazing piece or should I say several! What a wonderful project! Anita, this is AMAZING! I'm sure jaws everywhere are dropping as mine did (thud!). The houses are spectacular! Every little door is so unique, and I love how you numbered them. You've included so many products... it's a Holtzian dream. How long is this beauty? I'm just in awe of your creativity!!! Holy Moses, Anita. I am blown away. This is one of the most incredible things I've ever seen! Holy moly, Anita! This is incredible!! Seriously, seriously beautiful!! OH Duh, like I am speachless! Thank God I have fingers to type with! Anita, I do believe this is the most spectactular home decoration I have seen! You have so rocked this in so many ways@ Love the village you created! Wow!!! So how long did it take you???? Oh my gosh have you been working on this forever? It is stunning what a work of art! I am so thrilled to see this fabulous work of art Anita.It is so detailed so elaborate virtually perfect in every tiny particle you look ..it is true art that keeps the eyes dancing from one point to the other and this is true art. Thank you for giving of yourself such a labor of love for all of us to behold..and I know your family will enjoy forever what you have made. Wow it so beautiful! Your little town is really stunning and gorgerous. Ingenious idea I cannot feast my eyes. I love all your houses of little town with all the wonderful elements you've used on each one! So fun!!!! and fabulous!!! Ok that's it...you win...this is just sooo amazing Anita! 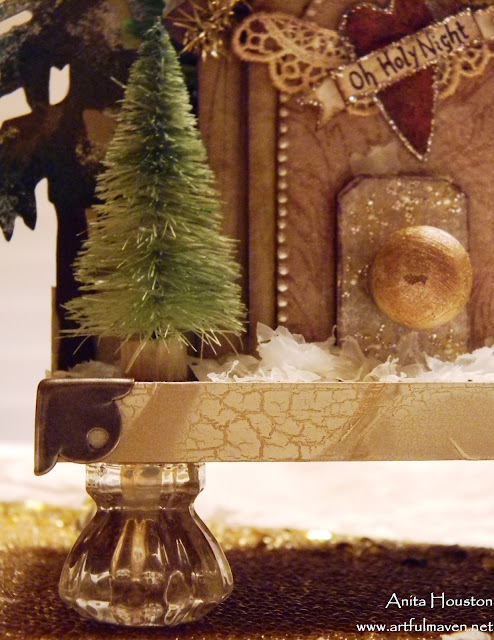 All of the different techniques and little details - it's a piece to die for! Congrats on this amazing work of art! Oh. Oh. Oh. 'Scuze me while I pick my jaw up off the desk. I don't know where to begin...just so much amazing artistry here...whimsy, delight, beauty, imagination, creativity...I am just blown away, Anita. I can't even begin to tell you how much I love this incredible, incredible piece. You ahould be so proud of yourself, first for imagining it, and then for creating it with such skill. One of the most beautiful things I've ever seen. Wow. WOW! This is wonderful, gorgeous, amazing Anita. I love it! What a beautiful,(even magical) village to display and bring out every Christmas time from now on, the night time view is beautiful too. This will be a major talking point for every one who visits. It must have taken you many, many hours to complete, with all the great detail and work you've put into this project. It's no wonder you're proud of this. I can imagine Santa will be visiting this village for sure! Goodness me that was a labour of love and it looks well worth it too! Oh my giddy aunt as we say over here, this is incredible Anita and I'm absolutely blown away by your talent sweetie! How absolutely wonderful this is going to look in your home Christmas after Christmas, it's divine! Wow! I am speechless...this is beyond stunning. How creative and gorgeous! I love your take on the 12 tags! Why do I never dream up pieces like this?? I bet they are even more stunning in person. I'm reeling - you know that feeling when you fall in love at first sight?! 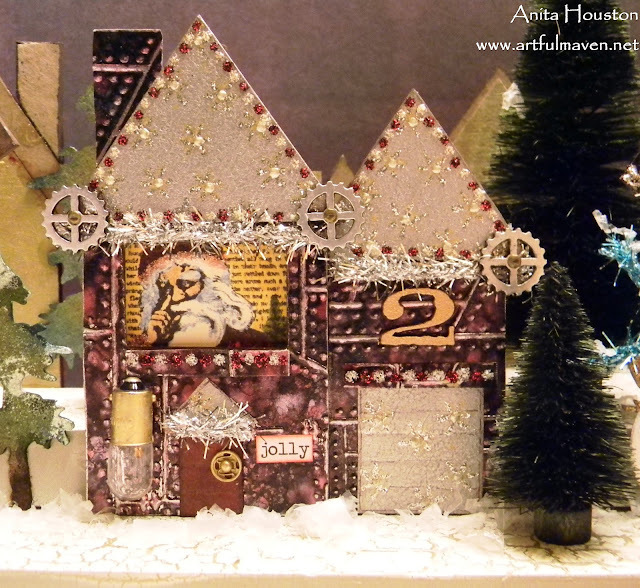 Having grown up with dollshouses, any miniature scene is likely to capture my heart, and when you combine it with the amazing inspiration of Linda's 12 tags, and then you LIGHT IT UP... well, I'm a goner! Utterly captivating - you're out on your own with this one - hope it wins everywhere!!! Oh this is utterly glorious. Houses will always get my vote anyway(it's my dollshouses that butterfly has grown up with) but this execution is simply brilliant. I have always wanted a Christmas Village - this one would be just perfect! As butterfly says, it deserves to sweep the board....and I hope it does. I don't have words to describe how wonderful I think this is. It is about the most amazing piece of mixed media artwork I have ever seen. Every tiny bit is so wonderful. And to think its a takeoff on the 12 tags challenge. Who would of ever thought of making something like this with the tag themes. Totally brilliant! You rocked the world with this masterpiece. Thanks so much for playing along with the 12 tags challenge. Oh my gosh, this is one of the most amazing creations I have ever seen, love each and every detail, so many wonderful elements. Such an amazing treasure for years to come. OMG, are you kidding me??!!! You are AMAZING!!! Thank you so much for sharing your fabulous-ness!! After I get my jaw re-set, I will be spending hours staring at this beautiful creation! WOW Anita!!! This is absolutely AMAZING!!! That is just a gorgeous creation. Just awesome! Somehow that comment went through twice, however, I did want to come back and ask if you mind if I take my next Sleigh Ride along here? I'd need one photo and just link back to your blog. This is just a wonderful centerpiece! I'll also be featuring some houses from my FB page, slightly different though. Oh my goodness, oh my goodness. Have you been working on this since LAST Christmas? I can't imagine being able to do something like this. You are amazing. WOW!!! 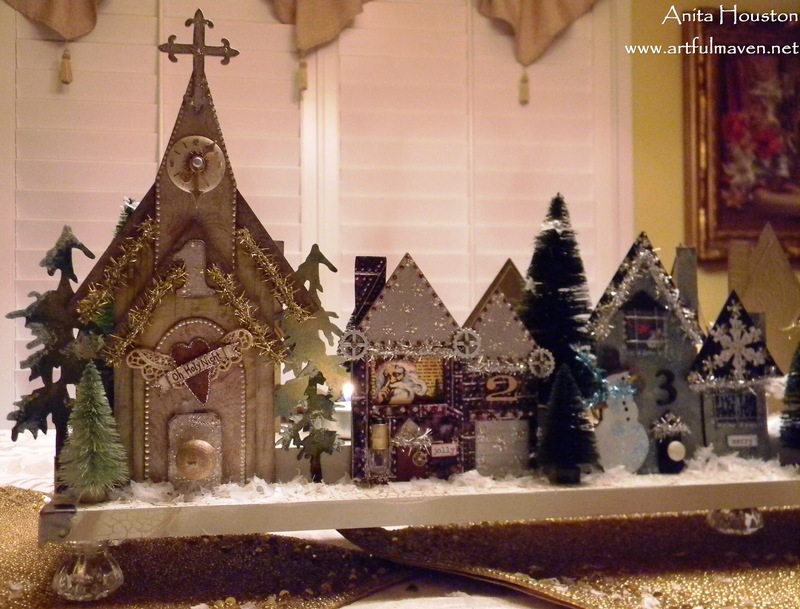 I love these now this is a village i would put up in my house!! thanks for sharing. I'm missing words, that's an outstanding creation. A WONDERFUL decoration for Christmas. Anita, this is amazing! I am blown away. I am just awed by this. LOVE. Holy row of houses!!! You really should have added a warning sign at the beginnining of the post. It's so very difficult to call paramedics when you're passed out. O_O. 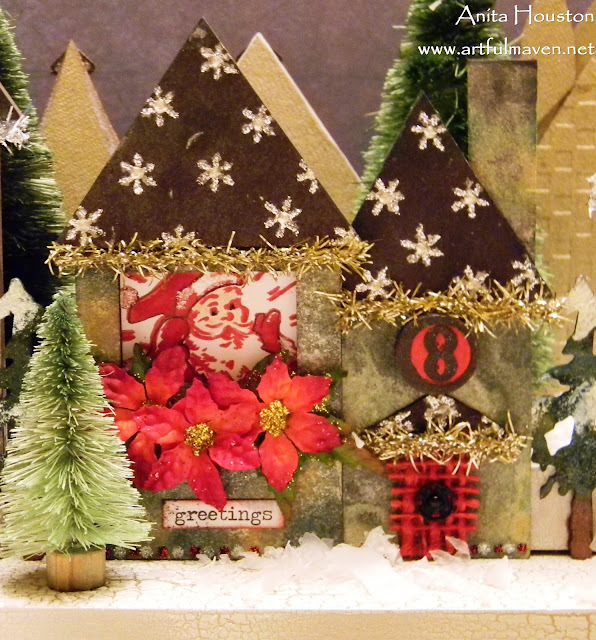 Howdy doody chica, this is one of those times I want to be miniature and live in a perfect little Christmas village. It's difficult to see in type, but I'm standing on my chair and giving you an ovation of accolades and praise. This is sensational and dadgum...now you're finished and I'm NOT!!! ;) This should stay out all year long. It's just amazing. Take a huge bow, this freaking ROCKS!! I am speechless! This takes my breath away. Thank you so much for sharing your wonderful art. WOW, Anita...just fabulous how you based each on a tag. I really like it, you truly outdid yourself. Love it, love it, love it. wow you are simply amazing dear!! they are just sensational! I love them all!! Can't even imagine doing all that work! you rock dear!! fabulous!! Words just fail me for this enormous piece of sensational art! I can't lift my jaw off the floor! Absolutely mind blowing, stunning, amazing... could go on forever! Such detail and hard work. Phenomenal, breath taking and absolutely unbelievably GORGEOUS!! Thanks for sharing! i don't usually do this but was so inspired by this piece. thank you so much for sharing this wonderful creation with us. WOW! this is so cool! I love your little village. All the details are fabulous. Jaw dropping ... AWESOMELY AMAZING!!! WWOOOOOOOOOOOO ... these details are sooooooo gorgeous. One WONDERFUL Village !!! What an amazing project ... WOW!!! I am totally awed!!! Wow Wow wow, Anita this village is amazing!!! 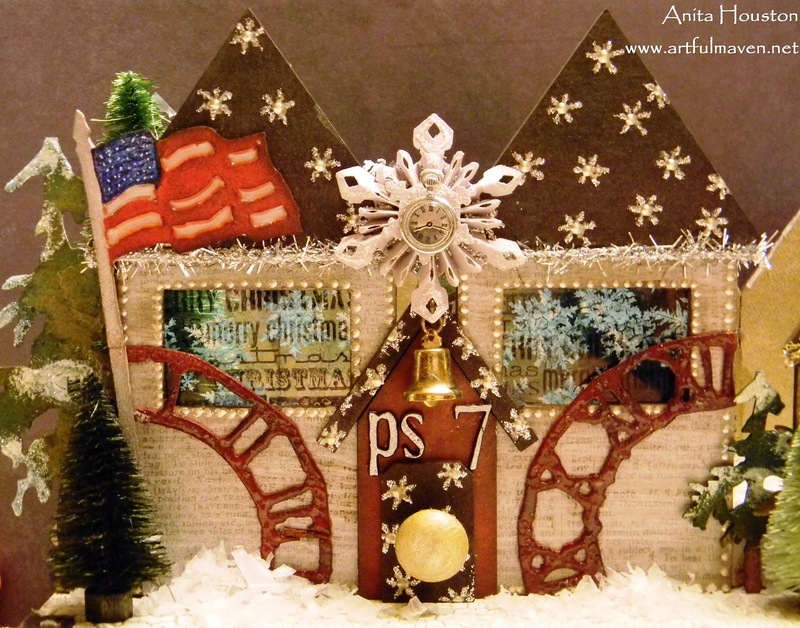 I can’t imagine how much work you put into this creation…so many great details…I love it! OMG!!! Tis is totally fabulous!! You rock! You never cease to amaze me. Blessings! Fabulous project! Utterly stunning and sooooo many details, just amazing!Thanks for sharing it with us at the Artistic Stamper!! Seriously, Anita, this is absolutely A.M.A.Z.I.N.G.!!!!! I love every little detail you put into it...all came together for something quite spectacular!!!! B.R.A.V.O. This may just push me to close my studio and just enjoy your fabulous creations! Thank you so much for sharing your work! Truly, a magical piece! Anita, I just got the chance to see your village and I am totally blown away! And to think I was proud of my little birdhouse, LOL. This is gorgeous, creative, and it has just about rendered me speechless. Bravo! This takes my breathe away. What a fantastic Christmas village. Congratulations!!!!! I hope I end up in your little village because right now I'm being blown away and don't know where I'll land! Who wouldn't want to live there?! Beauty X Nostalgia = World Class Awesome! It just says LOVE to me. This is sensational - what a fantastic project! Happy Holidays! Wow, wow, wow! Where to begin with this beauty. Anita you have seriously created a masterpiece. I can not begin to imagine the hours you must have put into your Christmas Town, but it was worth every second. Congrats on creating such a beautiful work of art. And thank you for sharing it with us. WOW....beyond spectacular Anita!!! 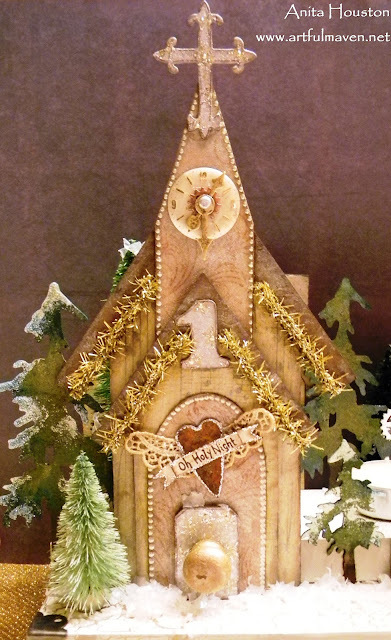 I'm totally inspired to go and buy that die and make one of these for next year! Your details are fabulous and I think I need to go back and stare at all the photos again and again and again!! You've created an outstanding piece of artwork! Positively mind-blowingly amazing! I'm in awe at the amount of work and creativity put into this fabulous creation! Anita you are amazing! Love it! Wow! Absolutely stunning! I am in awe of the amount of creativity and work that was put into this village. A work of art! Anita, That is one amazing centrepiece, and it certainly is a home for Christmas piece! Thank you for joining in The Artistic Stamper Challenge this month. AMAZING, stunning and i love them all!! Entered here through Tim's Blog and I'm in love with what I see. Artful Dwellings are the perfect kind of die to own because it is infinitely useful and your imagination can run wild. 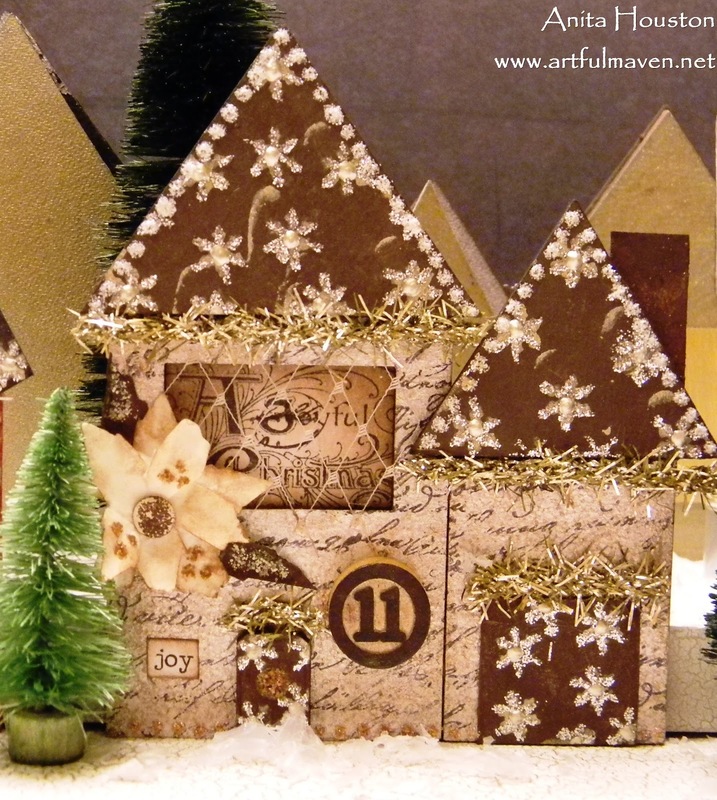 These houses are absolutely precious, they can be little scenes as shown, Christmas tree ornaments, Tags on a gift, I'm wowed! Just awesome! Can look at it forever and discover new things in your heartistry! Wow Anita! Your work always is amazing, but this display blew me away! I am enjoying my visit to your "hood". Love all the details and the sparkle and the night views too. Oh my..I love all your buildings especially the church and school. I was wondering how long it took you to create this? Have a blessed holiday season! This is absolutely stunning!!!! 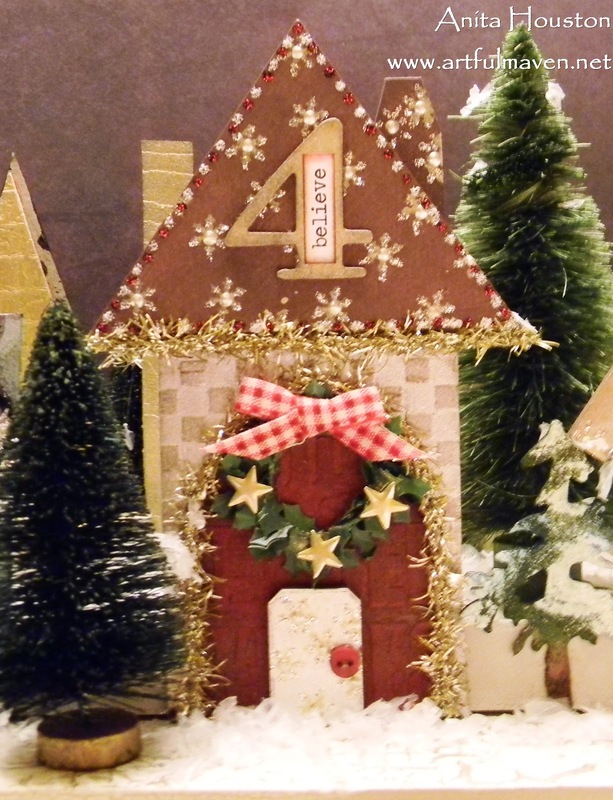 I love that you based it on the tags and used them as house numbers too. Beautiful! I am completely speechless. Amazing village, Anita. Fabulous village, simply stunning. Thanks for sharing. Absolutely amazing! That must have taken forever! Thanks for sharing your incredible talents!!! I'm sorry I missed this but lucky that you know who mentioned it! Just a few words to describe this: stunning, amazing, sensational, beautiful, inspirational, knockout etc. etc. etc. Do you get the picture?? LOVE IT! I'm pinning (as you would say!!) as many of the pictures as I can!! Stunning! It's a fabulous project. This is just FANTASTIC. Need I say more????? OK, your village centerpiece rocks!!! Sooooo creative! I have always loved little miniature houses and villages. This is incredible, and it makes me want to quit my day job and sit at home making little houses. Maybe I can get a village made by NEXT Christmas if I start now! Thanks for sharing this amazing little village with us. I now have to go find the inspiration tags to connect the two. Oh my word!!! This is super duper cool!!! I am in total awe!!! You have crafting super powers for sure!!! Just a wonderful,project Anita!!! Bloomin brilliant!! Gonna share on my Facebook as want everyone to see your fabulous work!! Anita, Absolutely gorgeous!! I am going to come back later tonight and look at each building carefully as I love each one. I would love to see this in person as it is awesome. Glad I dropped by for a visit (LOL) now I need a cup of tea and a long period of quiet to enjoy it!!! love love love it...fabulous. Thanks for sharing! 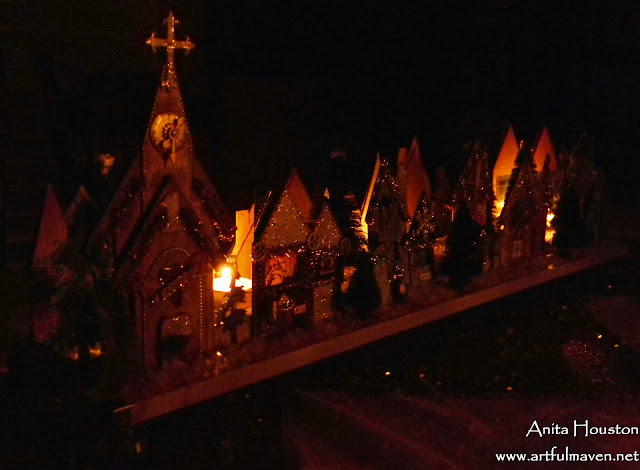 WOW... what a fabulous Christmas village!! I love each and every one of them, great job! I am completely in awe of your creation. It is stunningly beautiful. how beautiful, you are so talented. Oh i just love this! 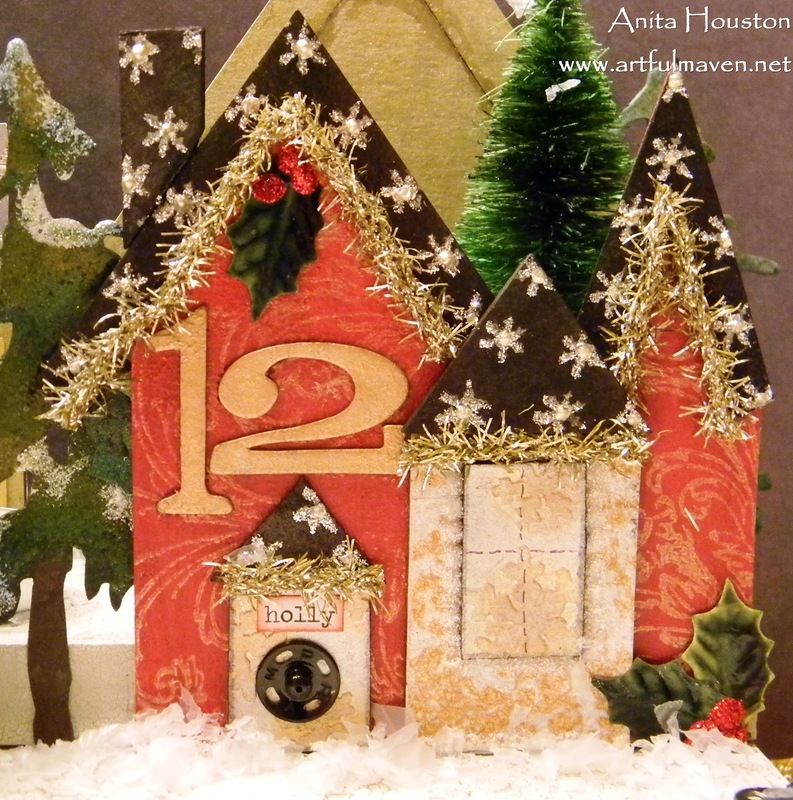 It gave me a great idea for using up some of my glittery stash to make a Christmas village book! Simply beautiful!! Words fail me. This is utterly fabulous. 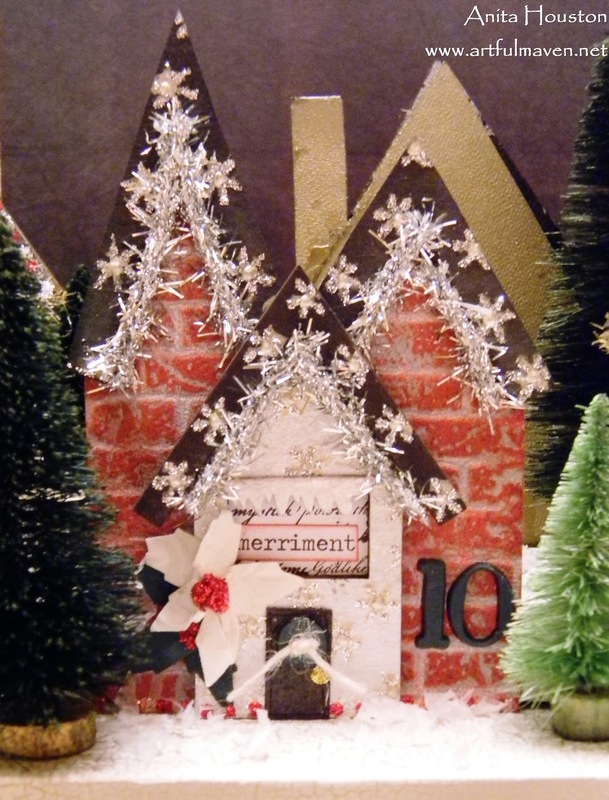 This is fantastic, so glad I found your blog through Carmens'Beyond the fringe crafts' blog..gorgeous work...oh! to be tiny enough to wander through it...fabulous. I am SO glad Tim linked to your blog from his! This is absolutely beautiful! What a delightful work of art!! Wow! This is unbelievable! I have had the artful dwelling die for a long time a d wasnt sure what to do with it. 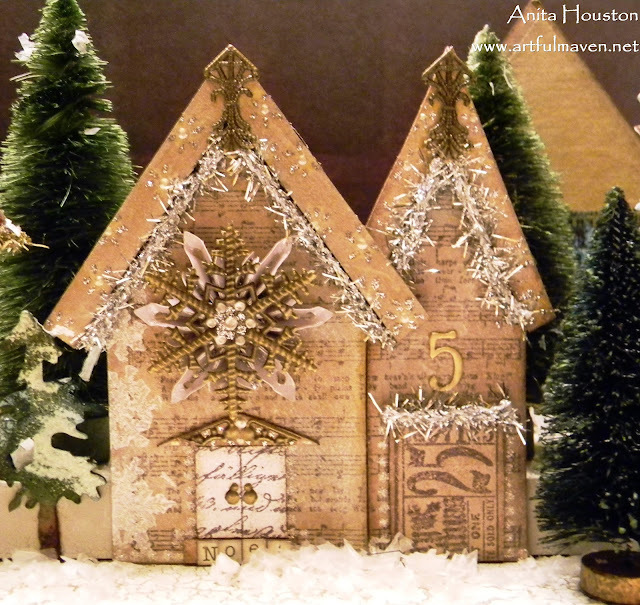 No wonder Tim Holtz has this pic on his blog. You are worthy! This is a lot of creativity. You are amazing. You have a lot of talent and thank you for sharing it. I needed this to inspire me to finishmy christmas cards. Hopped over here on the recommendation of the King of Craft himself and boy can I see why he is so blown away with your project - its fantastic. I don't usually leave a second comment, but wow! Congratulations on the 1st place at Simon Says ... what an amazing piece ... thank you for such wonderful inspiration! Linked over from Tim and so glad I did! This is just amazing and wonderful! Congrats too! Congrats on first place at Simon Says! You deserve it, this has to be one of the 7 Wonders of the Crafting World. Absolutely AMAZING!! This is a delightful village and I can see there will be a few 'Anitaville' inspired villages appearing in the future. I'm really impressed with taking the ispiration from 12 tags and turning it into a decor piece. 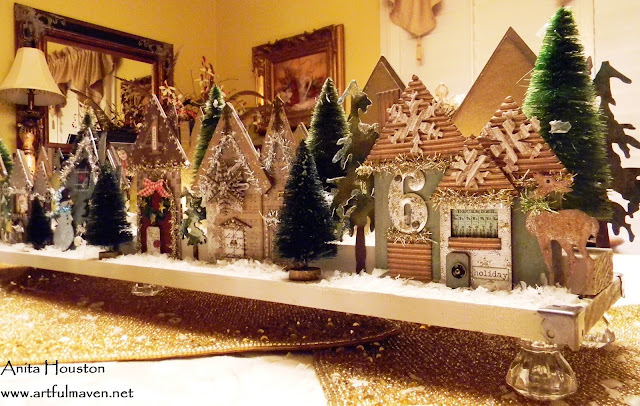 How wonderful it must be to see this creative piece in the middle of the festive table. LOVE your work. Congratulations at SSS - your houses are just amazing! I am still catching up on e-mails sent before Christmas (I took a week to visit my youngest son and his wife and their new twins in CA) and came across your amazing village. Your creativity is just astoundingly magnificent! I love what you made and keep looking at all your special touches! Thank you so much for sharing this amazing creation! Happy New Year to you and yours! I am speecless!!!! It's so fantastic!!! Make It A Christmas Tag...On Video?! ?